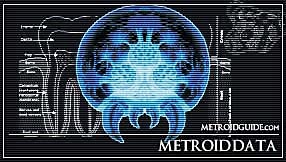 Note:Federation scientists are speculating that the Hatcher Metroid might be a phase of a Metroid life cycle that leads to the development of a Metroid Prime. The Metroid Hatcher retains its ability to float through use of kinetic energy, but its outer mandibles are replaced by tendrils as it increases in size. 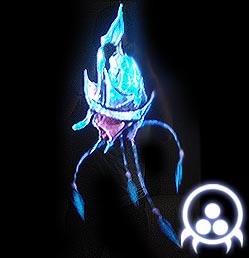 They also loose the ability to shift into a phase state, taking away that defense, but their shell has developed to the point that the Metroid Hatcher is in general invulnerable to most weapons. When entering this life phase Metroid Hatchers can also reproduce, but instead of laying eggs they give birth to Miniroids inside their body that rapidly developer into mature Phazon Metroids, these newborn Phazon Metroids emerge through the Metroid Hatcher’s mouth. The Metroid Hatcher uses its offspring during a battle, when it feels threatened enough it will release its young to attack the creature that has hurt it. 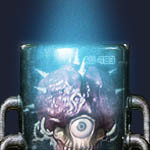 Weak spots of the Metroid Hatcher are the ends of its tendrils and its mouth through which its inner organs can be hurt. Metroid Hatchers will try to subdue a possible prey by attacking it with its tendrils, if the prey attacks the tendrils, the Hatcher will retract them in its body and instead unleash Phazon Metroids from its mouth, a quick sharp shooter can directly hurt the Metroid Hatcher by firing into its open mouth. By ripping off a Metroid Hatcher’s tendrils the creature can be severally wounded, the loss of all its tendrils often leads to the Hatcher’s demise.